It’s a common knowledge among many bbq enthusiasts that you don’t have to be from Texas to smoke and enjoy a tender smoked brisket. Dating back to the indigenous Indians of southern Texas, brisket has risen in popularity among American meat and BBQ lovers so much that it would be really hard to find a BBQ connoisseur who hasn’t smoked or tried to smoke a brisket at home. Nevertheless, recipes to smoke a brisket had gone through lots of alterations and numerous variations had been created to please the different taste buds of the gourmands. As a brisket lover, I believe a Texas style brisket is the best one to start your journey towards smoking (meats of course). So, here at Grills Forever, I’m writing this guide on how to cook beef brisket to serve your inner foodie and help you to become the ultimate brisket master. 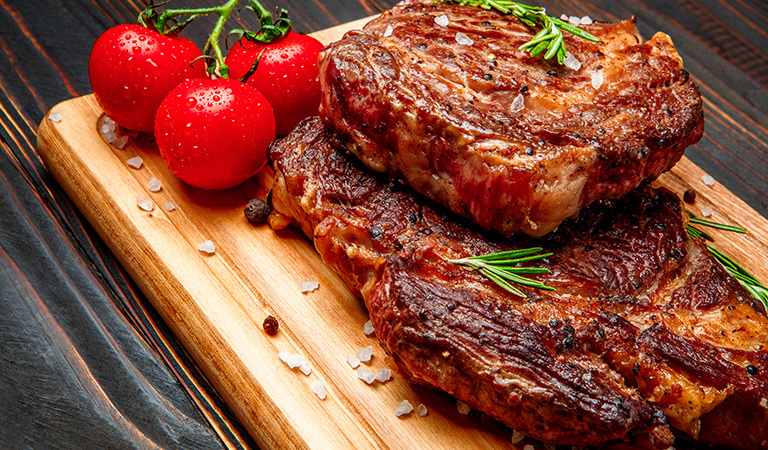 A good bbq starts with the right selection of meat. Sadly, to smoke a beef brisket simply buying the meat isn’t enough. In fact, it’s only the beginning. Let’s talk about how to cook beef brisket in step-by-step detail. You need to buy a piece of brisket that contains the best marbling of fat on one side. As cold briskets are much easier to trim, you can keep it in the refrigerator until you are ready to size it up. Trimming the cut is absolutely necessary so you can cook your brisket evenly without any burns. For trimming, place the piece on the cutting board fat side up. Our goal is to cut down the waxy, dense type fats that never meltdown. Start by making shallow cuts with your knife keeping it almost parallel with the brisket. The fat will start to roll up from the flat side towards the point side. After you are done with that, you can leave about a ¼ inch of fat on the brisket as it’s not absolutely necessary to cut the delicate fats. It’s useful to remember that the seasoning and smoke don’t penetrate much further than about ¼ inch. Therefore, the more you trim the fats, the more flavors your brisket will absorb. Now that we are done with all the surface fat, let’s remove another huge chunk of fat that you will find towards the pointed end of the brisket, the one partially separates the point and the flat. Please note that you’ll need to apply some very vertical cuts to remove this fat. Now you are done with one side, you need to focus on the other side of the brisket. Notice the lack of the waxy type of fat on this side? So now you only need to dissect the huge chunk of fat that you had removed last on ‘the fat side’. If you are done with all this, congratulations. You just saved yourself 4-6 hours of cooking time (if you were opting for slow smoking) and you just removed the barrier between the meat and the spice rub. Once you have sized up your brisket, the second step is to prepare the spice rub and apply it. In order to really make the brisket soak up the flavors, you have to season it at least for one hour before smoking. You can use the ‘Dalmatian rub’ which is just a combination of salt and black pepper. Salt usually works as a flavor enhancer for your taste buds, helps to wake up the flavor of the brisket and the meat to preserve water. Nevertheless, a homemade ‘Dalmatian rub’ gives you the freedom to fix the amount of salt and black pepper per your liking. You can also use two different types of spice blends called ‘dry rub’ and ‘wet rub’. The smoked brisket dry rub is a mix of spices and dried herbs while the other is a mix of water or oil with the spices to boost up the flavor. You can also use another spice mix called ‘pesto’ which is a classic version of wet rub with an oil base. But then, if you prefer the taste of any pre-mixed seasonings, go ahead and use it. However, please keep it in mind that a raw rub tastes far more different after cooking. As soon as the juices of the brisket get mixed with the herbs and spices, they go through chemical reactions where the heat of the smoke works as the catalyst. Apart from these seasonings, you can and should opt for a brisket injection to inject moisture and flavor directly into the meat. You can use salt water as a basic brine for your injection. However, Worcestershire sauce or soya sauce can be added into the brine for a better taste. The best tasting dish is the one that has the combination of all five tastes in just the right amount. So, if you want a hassle-free, tasty brine that’d give you just that, I’d suggest that you add in some salt; sugar and Worcestershire sauce for sweetness; add in a little tanginess with a combination of soy sauce and lemon and finally, add in a tinge of tabasco to fire it up. The hint of bitterness within the cayenne and black pepper on the rub will add in the little bit you need. The fat and the protein in the meat bring in the natural umami flavor, and together, you’ll have the perfect taste through and through. A smoker sustains low cooking temperatures for an extended period of time through producing smoke around the brisket. You can use a wood, gas, charcoal, electric or a pellet smoker. But the truth is, it’s always up to you what kind of smoker you want to use for your brisket. The focus here is to keep the heat stable while maintaining a steady flow of thin blue smoke. You should always consider placing the brisket ‘fat side’ up on your smoker as the melting fat releases oil into the brisket and keeps the moisture intact. 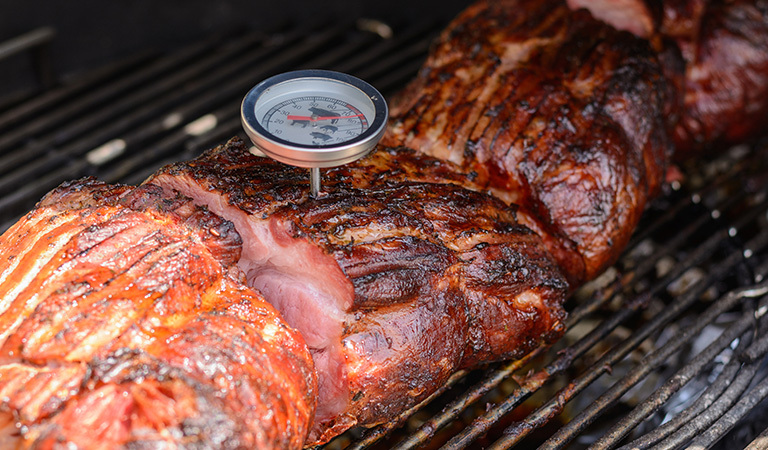 If you are using a digital temperature meter, it would be better to use a probe connected to the meter and keep it in the brisket the whole time. If you do not own a digital one, feel free to use an instant-read thermometer so you can check the temperature of the brisket. How Long to Smoke a Brisket? The ideal temperature to smoke a beef brisket is at 225 degrees for about 1 hour and 15 minutes per pound. The brisket smoke time per pound may vary considering how many times the smoker you are opening, the type of smoker you are using etc. So, there is no fixed way to determine a smoked brisket cooking time. Using aluminum foil is a controversial choice among bbq fanatics. However, using it does have some benefits, such as increasing the cooking time, helping the meat maintain moisture; even saving the brisket from collecting too much soot from the smoke and becoming bitter in the process. It can be an easy solution to a common problem called ‘Brisket stall’. A brisket stall is a time or zone when suddenly the temperature of the brisket stops rising. That means the brisket just stops at the middle of smoking and leaves the temperature plateau in which it was supposed to be smoked. To fight this, you can wrap the brisket up in foil when the internal temperature of the brisket reaches 165°F. You can also use a spray bottle to spray some apple juice or apple cider vinegar while checking from time to time. After your brisket is done, it’s time to slice it. Oh wait… don’t just cut your brisket right after it is cooked. Wrap it with a foil paper and let it rest from 1-4 hours. Nevertheless, letting it rest for one hour is the best timing. And after letting it rest, go ahead and enjoy your brisket. Hopefully, it would fuel your stomach and your soul. Previous articleEnjoy Sumptuous Barbecue and Grilled Dishes in the Comfort of Your Backyard!